Have you ever witnessed somebody who has never deadlifted before in their life walk into a gym and perform a perfect (and often quite strong) deadlift with absolutely minimal coaching? This is a phenomenon I witnessed a few times, and like most people I put this down to them coming from a sporting background or having ideal levers. However, after looking at quite a few people who have had this ability, I’ve found this often isn’t the case. 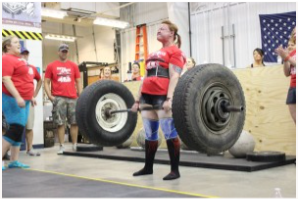 People with the LEAST ideal levers for deadlifting often were able to deadlift well on their first try, and these people often had no sporting background. After spending some time coaching these newer people, I found something common in everybody who had this knack for deadlifting – they were all able to perform a basic hip hinge very successfully, most with almost a 90 degree ROM (ie. torso parallel to ground). This being said, you would think that developing this movement pattern would be a priority for the majority of new gym attendees out there right? Unfortunately this is rarely the case, but Valhalla Strength – South Brisbane is here to change that. The hip hinge is one of the five basic movement patterns – squat, hinge, upper body push, upper body pull and carry. Forming the basis for the deadlift (and anything related to it), the hip hinge consists of two phases – hip flexion with a posterior weight shift while retaining a completely neutral lumbar spine, followed by complete hip extension via the hamstrings/glutes and ending up in a neutral but ‘stacked’ position – neutral pelvis, slight lordotic lumbar spine, rib cage tucked down and shoulders directly over the middle of the foot. This movement pattern performed correctly ensures that the abdominal muscles are being used to stabilise and brace the lumbar spine, and the hamstrings are being used for the majority of hip extension, with extension being concluded by the glutes. 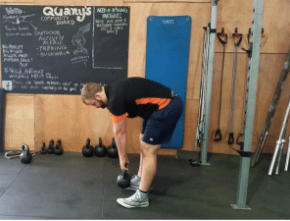 Given the importance of having a strong (and hopefully safe deadlift), this is undoubtedly the most important movement pattern for the strongman and strongwoman as well as being the foundation movement for a whole host of fantastic supplemental exercises – barbell hip thrust, any deadlift variety, the setup for the Pendlay row and even has it’s fingers all over Olympic weightlifting. I believe that poor hinge patterning is also a large risk factor in workplace injuries caused by picking up objects off the floor – at every workplace health and safety meeting you see, there is a huge focus on “lifting with the legs” – however from a biomechanical point of view the hip hinge allows you to utilise the legs safely and effectively without having to “squat” any items up (great for older populations who have knee injuries). Now you have a bit of an idea about what the hinge pattern looks like, what are the effects of a poor hinge pattern? • Excessive erector loading while deadlifting,instead of utilising the hamstrings. Fixing and perfecting the hip hinge should therefore be a massive priority for everybody stepping foot into the gym, even more so for anybody who has a lower back issue. 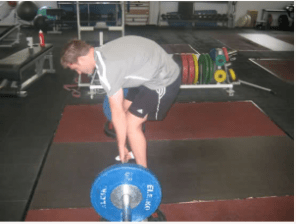 On multiple occasions I have had with clients who have been unable to deadlift without lower back pain, but after proper cuing of the hinge pattern and working on increase its ROM, they have been able to deadlift with no pain whatsoever; as a strength coach I am not here to try and ‘fix’ pain, but if we can take care of it incidentally then all the better! 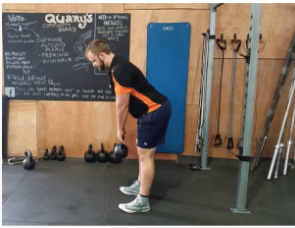 There is another big benefit to hinge pattern work for anybody who is chasing strength goals – hinge pattern work will directly contribute to building a stronger deadlift EVEN with very low weights due to neural adaptions. Let’s now have a bit of a close look at the hinge, and how it can be used for a great deadlift. The way I teach hinging for most new clients is simple – starting with feet roughly shoulder width apart and a slightly tucked pelvis (to reduce the anterior tilt that most people have, and line up the pelvis to the diaphragm) and after breathing in and bracing your torso, push your hips backwards while having your knees slightly unlocked (but not bending from them). Continue ‘reaching back’ with your hips until you feel your hamstrings get tight, and your shoulders can’t go any lower without needing to flex through your thoracic or lumbar spine – it can be useful to either perform these sideways in a mirror, or have a friend watch your lower back. 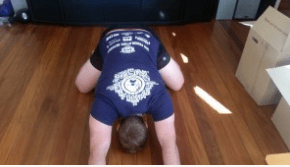 Initially, it will be hard to tell when you reach the limit of your hinge ROM and your lumbar spine starts to bend, but after a bit of experience it will be easy to feel where this point is. The goal is to hinge to just before that point. Most people will have a tendency to want to just bend over – this is NOT what we want, as it will result in an anterior shift in weight. If you are moving and feel yourself tipping forward, this is occurring. It may also useful to stand around 10cm in front of a wall/rack/box, as you will know you’re doing the right thing if you feel your glutes come in contact with whatever is behind you. Once you have reached the point just before lumbar flexion occurs, squeeze your hamstrings/tuck your pelvis posteriorly to extend your hips until you get to the point where you are your tallest, then give your glutes an extra squeeze at the top. This should coincide with the ‘locked’ deadlift position’ – slight lumbar lordosis, ribcage tucked down, knees locked, neutral shoulders. Perform 3-5 sets of 10 reps with zero weight to get a feel for the movement before you decide to progress from there – this is also an ideal warmup for any sort of deadlifting movement, and can be performed multiple times a day every day. Some do’s and don’ts are below. Now you know what the hinge movement feels like, it’s time to get an approximation of your ROM. My opinion is everybody should aim for a ROM of 90 degrees (that is, with the knees straight the torso is flat to the ground). If you already have this, then you should still be working on the hinge pattern frequently for the neural adaptions and carryover to most posterior chain exercises. A common view held by people that are aware of the hinge pattern is that limited ROM is caused by tight hamstrings (as is the misconception that tight hamstrings cause poor squat depth). Having tight hamstrings will be common to anybody that has a poor hinge pattern, however assuming that it isn’t caused by other issues (injury, severe anteriorly rotated pelvis, etc), tight hamstrings are generally a SYMPTOM of a poor hinge pattern – not the cause! Movement-based ROM limitations are your bodies way of stopping you from getting into positions where it lacks muscular control – in essence, your hamstrings are only tight because your body has NO idea what to do when it goes past the point where the hinge stops! This is the fundamental difference between flexibility and mobility in my opinion – flexibility is just the ability to bend a single joint to the very ends of your biomechanical ROM, whereas mobility is the ability to get into these end-range positions and have the muscular control and strength to produce force there. The first step is of course to diagnose your hinge ROM. I don’t believe being completely accurate is necessary, as only having a ROM of 45 degrees or so will be very evident and a sign that you need to work on it. If you have less than 90, the way I’ve helped develop it in clients is outlined below. • 5 minutes of rockback or 90/90 breathing (recommended to all my clients, regardless of goals or background). This helps activate torso musculature and relax hip flexors/spinal erectors, and in itself will often increase hip hinge ROM. 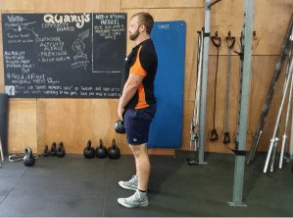 • 3×6 weighted (kettlebell or dumbbell that weighs 5-10kg is ideal for the majority of people) hinges with a 5 second pause and complete exhale at the bottom of the movement. Keep these strict, and don’t go into lumbar flexion. The reason for the pause is simple – your body starts becoming more ‘comfortable’ at this end range, and over time the ROM will increase. Adding in the exhale is a powerful way to stimulate the vagus nerve, which will help release tight muscles and speed up the process. Ever wonder why masseuses will tell you to keep breathing while you’re getting something tight worked on? This is the reason! 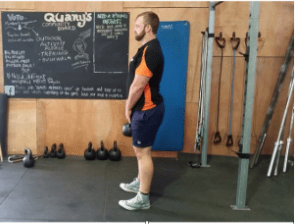 Performing this exercise frequently will go a long way to improving your hinge pattern and help increase strength in movements that require a hinge.